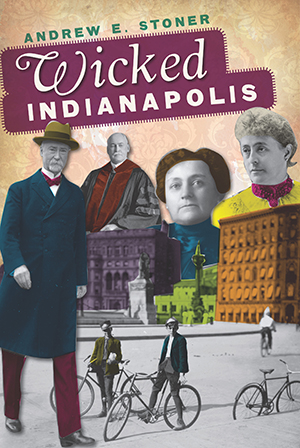 These are not the aspects of Indianapolis history you'll see flaunted in visitors' brochures. These are the abhorrent, the grim, the can't-look-away misdeeds and miscreants of this city's past, when bicycle messenger boys peddled through the night to link prostitutes with johns and when the bigoted masses tightened their grip on the city behind mayor and Klansman John Duvall. From the unseemly to the deviant to the disastrous, Hoosier Andrew E. Stoner brings you lives as out of control as the worst wreck at the Indy 500 with a history as regrettable as it is riveting. Andrew E. Stoner (born 1964) is a native of Goshen, Indiana, and lived in Indianapolis for twenty-six years. He started writing as a boy by teaching himself to type on an old Underwood manual typewriter. A journalist by training, his writing has been published in the South Bend Tribune, the Goshen News, the Indianapolis Star, the Indianapolis Recorder, Sports Illustrated and Colliers Worldbook Encyclopedia. He holds a bachelor's degree in journalism from Franklin College of Indiana and a master's degree in journalism from Ball State University. He is currently completing a PhD in journalism and technical communications at Colorado State University, Fort Collins, Colorado.